If you want a quite relaxing holiday in a beautiful location yet within easy reach of the local amenities then this villa is definitely worth considering. Three excellent bedrooms, master with TV DVD and en-suite the other two rooms share a bathroom. Excellently equipped kitchen and dining area capable of seating 8 people easily. Large lounge with TV DVD. Front terrace has table and chairs to enjoy eating outside, the side terrace which is accessed from all the bedrooms, kitchen and sideway, has a gas and charcoal BBQ's and plenty of cushions plus a hammock for relaxing and chilling out. The villa is air-conditioned throughout, all towelling is supplied and there is a weekly maid service. The pool is serviced daily and is 10m x 5m x 1.6m thoughout with steps and stairs leading into the pool, there is also a section with a depth of .65m for small children to bathe. The gardens extend all around the property and are laid to lawn with extensive range of plants and foliage of all kinds. There is a enternal bar with fridge and all the other necessary facilites for you to enjoy the sunshine that little bit longer. We are a professional couple working in the Automotive Industry and Property Services Industry. We first came to Dalyan on a recommendation of friends, we stayed at the Alla Turka Hotel and very quickly fell in love with the area, the people and Turkish culture. On our third visit we spent two weeks searching for a property to purchase and after extensive research and hours in a dusty jeep we found the plot which ticked all the boxes. It took a few years for us to get the villa looking how we envisaged (you can't rush nature) but slowly it came together. The location proved to be exactly what we wanted, peaceful with beautiful senery yet easy access to the town and all the factilites on offer. 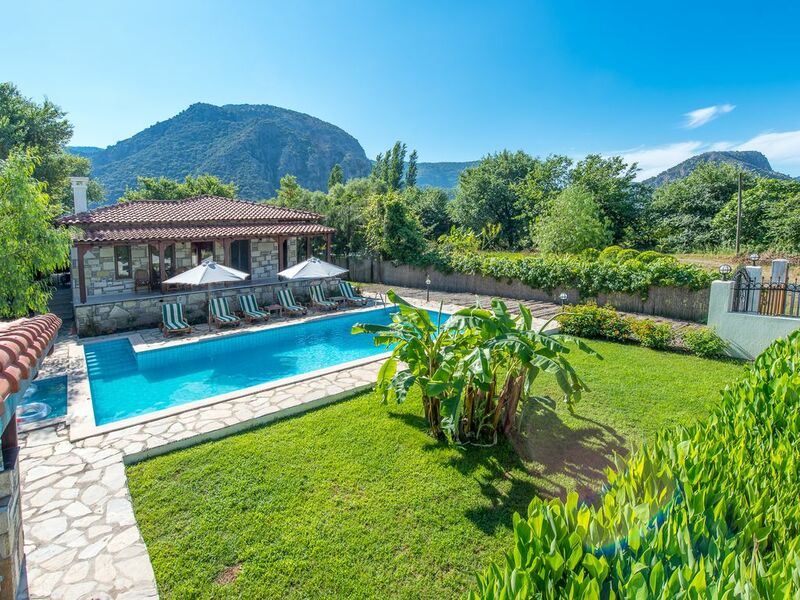 We have had wonderful family hoildays here and through offering the villa for rent we hope other familys will also benifit from the joys of visiting dalyan. Master bathroom consists of bath/shower, W/C and handbasin. Family bathroom consists of shower unit, W/C and handbasin. Lounge consists of two three seater sofa (which converts to beds) two single chairs TV and DVD player. Kitchen has an electric oven, dishwasher, microwave, toaster, Brevil sandwich toaster,water cooler, juicer, fridge/freezer, gas hob and all the necessary cooking utilities to make it home from home. This is a limited service of two English Speaking News Channels and a few addtional foreign and local channels. There is an extensive selection of films available. The nearest courses are in Belek which is a three hour drive so at present not realistic as a golfing prospect. Notes on accommodation: The villa has A/C throughout, the accommodation has been considered carefully to enhance the experience for guests. The pool depth is constant at 1.6m so kids would need to be good swimmers attended at all times to use the main pool. There are four mountain bikes at the property for the guests to use at their own risk. Outside: Private pool 10m x 5m depth 1.7m with steps and stairs as access. Gardens laid to lawn with plants and shrubs, driveway is lined with palm trees and the field is planted with pomegranate trees. The villa is in a quite rural location and the views are breathtaking. Utility Room: There is a small store room which contains ironing board and iron, clothes horse and top ups of toilet rolls kitchen rolls etc. There is also a washing machine. Cleaning / Towels / Linen / Maid service: Towels are supplied for the bathrooms and for the pool/beach. Maid service is once a week but can be called upon at any time. Ideal get away to relax and recharge. Every thing was as described no surprises lurking in the shadows. The pool was spotless as were the gardens. We left the property for three days to be closer to the WRC up at Asparan near Marmaris whilst the racing was great we couldn’t wait to get back to our little bit of Heaven. We walked into town most evenings via two back road routes never more than 1/2 an hour each way. We also used the bikes to venture a bit further but all the time wanting to get back to the Villa. It is quite and secluded no one overlooking you it was bliss. We used lots of local restaurants with never a bad meal and always good value. Will definetly be tempted to go use again. Top marks foor the Villa Doluca. Thank you for taking the time to write a review. We are so pleased you had a wonderful time and liked the villa, the location and Turkey. We would love to see you back again. I’m pretty sure we all said “wow” when we arrived at the entrance to the villa, well, apart from my son, who just said “dad, look at the pool” the photos really don’t do it justice, the gardens are beautiful, the location is perfect, you are surrounded by nature, the driver showed us into the villa gave us a quick lowdown on the essentials and left us to it, got our priorities sorted, dumped the suitcases and straight in the pool! heaven, you just wind down straight away, and that is what this villa is all about, winding down. it was a brilliant day out, I could go on, but I think you get the picture, if you want a totally relaxing holiday in a fantastic villa, then I can highly recommend Villa d’louca. So glad the villa and location had the wow factor. Hope you decide to return to Dalyan and if so we would love you to stay with us again. Had a wonderful stay at this villa., although out of town it is a easy 20 min walk into the town which we done every evening, loved the peacefulness and the fact that you are not overlooked. Pool was cleaned every day. Nothing negative to say , thoroughly enjoyed our stay and would recommend this villa. Thank yo so much for taking the time to review your stay at our villa. Glad to hear you had a wonderful time. This is now the third time we have stayed at this villa and, yet again, it was 1st class. The villa is situated about a mile from the town and is absolutely perfect for a quiet, relaxing fantastic holiday. It has everything you require to be completely self contained for the holiday, just buy your food! The pool is a very good size and is the best relief from the Turkish sunshine. It even has a great poolside bar with fridge so you don't have to go back into the villa to get that well needed ice cooled drink. There are four reasonably new bikes to explore the area and eat at some great local restaurants. There's a newly built restaurant at the end of the drive (about 400 yards) which is very reasonable & extremely convenient. The grounds are well maintained with orange trees, grapes & a banana tree. The rear view is mountains and the front is a Pomegranate field. There is only one other villa next door that can not be seen because of the trees. The front veranda looks over the pool and you can have your evening meal watching the sunset over the Pomegranate fields and mountains in the distance. The main bedroom has it's own ensuite bathroom, sofa and TV. The other two bedrooms have two single beds in each and share the family shower & toilet. The kitchen is fully equipped with everything you would require. You can catch the local bus, at the end of the drive, that will take you directly to the turtle beech or travel into Dalyan and take the communal boat. We have nothing but praise for this villa for it's facilities, location and overall standard. We would have absolutely no hesitation in recommending this Villa to anyone for a great holiday in Turkey. Thank you for taking the time to offer this review. So glad you had a lovely holiday at our villa. We all had a lovely break 6 of us in total. Including two 15 year old twins. The villa is spacious and accommodated us all very comfortably. It provides breath taking views of the mountains and privacy which adds to it peacefulness and appeal.. The lovely town of Dalyan is nearby and can be walked to in about 15/20 mins or cabs can be called from the villa and are not expensive and arrive quickly. There are also 4 bikes at the villa. We would all thoroughly recommend this accommodation and holiday destination. Glad to hear that the accomodation meet your expectations and Dalyan as a town. Dalyan is situated on a river one direction leads to the sea the other to Lake Koygeiz. The delta is considered as a conservation area and bird life is plentiful which encourages the twitchers. The local travel company Kaunos tours offer many activites i.e white water rafting, watersports, mountain biking, Jeep safaris etc. Iztuzu beach has been voted one of the top ten beaches in the world and extends for approximately 7km. The beach can be accessed by road or by river taxi from within the town at both points of access there are full facilites i.e changing rooms, cafe/bar toilets sun beds and umbrellas. Dalaman is the airport to which you would fly and can be flow to from most major UK airports. Transfer time from the airport to the villa is approximately 25 minutes. We do not consider car hire essential as taxis are cheap and readily available, you can negotiate with them to take you to any of the bigger towns of i.e Gocek, Fethiye for a day trip which allows you to take in lunch and not have to worry about drinking and driving. Car hire can be organised through Kaunos Tours if required. Edge of Dalyan town is about .6km centre of town is about 1.6km to walk as a stroll takes about 20 to 25 mins. Kaunos ruins can be reached by using a small row boat to cross the river from within the town and then walk about 1km well worth a day out. The other big towns such as Marmaris, are about an hours drive. Dalyan has many bars and restaurants suitable for all tastes the main street is less than 1km long with small turnings off to be investigated. Banks, post office, doctors, dentists are readly available in the centre of town. A Migros supermarket (Turkey's Tesco) also has a branch in the town along with many excellent local stores, butchers, bakers etc. Changeover Day: Changeover days arrival and departure times are completely flexible. However if guests departure and arrival days are the same the departing guests must vacate by 11:00 and the incoming guests may not access the property until 16:00. Notes on prices: Prices are for the property per week in UK Pounds. Transfers cost for up to three people £58 4 to 6 people £76 above 7 to 14 £88. Cancellation: If for any reason you are forced to cancel the booking before the balance is due we will refund the deposit in full. After we have received full payment if you were to cancel the booking we would require compensation. The scale we use is as follows:- 60-89 days 30% of total booking 30-59 days 70% of total booking 1-29 days 100% of total booking.